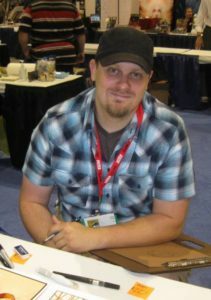 Skottie Young is most famous for his chibi Marvel variants, with a style that can be best described as cute but twisted; imagine a far more saccharine version of Looney Toons. When he branched out into writing, it made sense it that one of his first big hits would be I Hate Fairlyland, as this bloody-violent story about a little girl attempting to escape a dreamland full of candy and sweets is exactly what one would expect from him, and it works. Along with Bully Wars (his other creator-owned series) and Deadpool, it seems that Young enjoys over-the-top comedies designed to make the protagonist suffer. 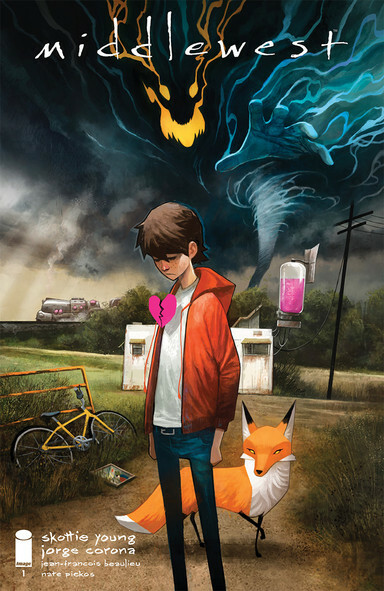 However, with his most recent comic, Middlewest, whose cover features a young boy, a sly fox, and a grinning storm looming in the background, things may be different. There was possibility that Middlewest could have been another typical Young story, but the winds have thankfully pushed him into a new direction. This tragic tale will blow people away. 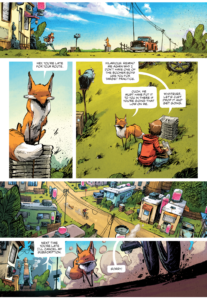 Young returns with his long-time colorist collaborator, Jean-Francois Beaulieu (Outpost Zero, I Hate Fairlyland), and Jorge Corona (No.1 With a Bullet). Published by Image Comics, Middlewest is about a young boy named Abel, who lives in the Midwest under the roof of his abusive father. His meek and mild-mannered personality shines as he is pressured by his friends and father to go against what he makes him happy and safe. What seems to be his familiar — a talking fox — acts as a Jiminy Cricket-like guide, only without a smile or song. After a heated and violent argument with his father, the already active winds grow wilder and suddenly gain sentience, forcing Abel into hiding, and onto his epic quest. 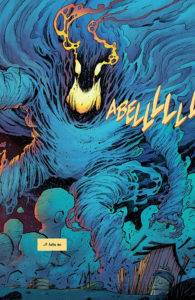 Middlewest is a shift from Skottie Young’s typical style, but it doesn’t waver too much. The protagonist is young and kind, living in a supernatural world where things don’t necessarily go his way. Young explains it best at the end of the first issue, when he discussed the creation of this story. Corona and Beaulieu are an amazing duo, the perfect choices to bring Young’s story to life. The colours and details deliver such a vibrant life into the Midwest, and though the art style is far more cartoony than photo-realistic, it doesn’t take away from the weight of the story. Abel’s father’s expressions are powerful; his transformation from cold glare to over-blown bellows of rage is spectacular. What really makes him terrifying, however, is his design. After looking through the development sketches at the back, anyone can be fooled by his generic style; he doesn’t look like your typical bully, at first, and his evolution from something a tad stereotypical into someone unassuming is oddly refreshing. Also deserving of credit among the numerous unique background characters, one can’t forget the wind. Corona and Beaulieu not only have an ability to draw the wind, but give it such a powerful personality that it exists even when it’s not part of the plot. Details like this bring the story together, making it whole. Unlike Young’s previous works, the first issue of Middlewest is nearly devoid of comedy. The violence is real, the abuse is heart-breaking, and it will bring on the emotional change. Abel’s father is an absolute monster, and his actions and reactions seem far too real to be anything but frightening. His relationship with his son is toxic, but the heart-breaking point is when Abel feels the need to apologize for his dad’s temper. “Dad please. I’m – I’m sorry.” Despite everything his father has thrown at him (in many cases literally), Abel feels that he is at fault, even if he’s simply a kid. When Gertrude from I Hate Fairlyland gets hit, she makes a quip and goes on her adventure; Abel, less so. His tears and trembles are real, and he will face a lot on his Wizard of Oz adventure, hopefully finding the strength to fight his bullies. If the team continues on this path, Middlewest will be a great success, and make Young into more than a one-trick pony. The second printing for issue #1 is available first week of January.